Johnny "Red" Kerr, the former Chicago Bulls coach who spent more than three decades as a broadcaster for the team, died Thursday. He was 76. Kerr died at his home after a battle with prostate cancer, Bulls spokesman Tim Hallam said. "His name was synonymous with basketball, both here in Chicago, and throughout the entire NBA," Bulls chairman Jerry Reinsdorf said. "Those that were fortunate enough to have known Johnny were touched by both his tremendous compassion for people, and his lifelong passion for the game of basketball. We will miss him greatly." 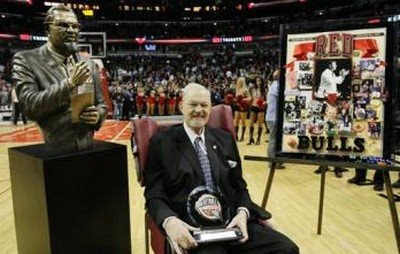 Kerr's death is a double blow for the Bulls, following the death also Thursday of Norm Van Lier, one of the most popular players in Bulls history. Van Lier was 61. "We're deeply saddened by the whole course of events today," Hallam said. Red was one of the best, that is for sure. Sad day for us basketball fans in Chicago that is for sure.